EDIT: I have refined this process somewhat. Please see this this post for some simple changes to my procedure which leads to a better tasting and more consistent candi. As described a couple of posts ago, I have been working on a method to prepare Belgian Candi Sugar at home. This method uses commonly available household ingredients to prepare the sugar, and requires no more equipment than you’d normally find in your average kitchen. I have posted my method in the following video, with this post acting as a synopsis you can follow in the kitchen. I owe a debt of gratitude to a few bloggers for helping me find my way – in particular, I’d like to direct you to the posts on Ryan’s Blog, Life Fermented and on An Engineer & His Carboy for the posts that directed my attempts. Before I go into the details I’d also like to point out that the method outlined in my video and in this post are the product of about a half-dozen trial runs. As such they represent a process in development, and may be subject to future improvements. If you have any luck (or ill-luck) in trying to make your own candi sugar, please let me know in the comments. EDIT: I have solved some of the crystallization issues people have been reporting when making candi sugar. Details can be found in this blog post. The method is fairly simple. I’m not going to cover the science in this post (it is in the video), but in short, we need to mix table sugar (sucrose) and dry malt extract (DME) to create the mixture of sugar and proteins the we need for the various reactions we are driving. next, we need to heat to 125-135C (260-275F) to ‘invert’ the sugar – inversion simply means we break down the complex sugar (sucrose) into the simpler sugars it is comprised of (glucose & fructose). Next we need to warm the mixture to 135-145C (300-330F) and alkalize (make basic/non-acidic) the mixture to drive maillard reactions – chemical reactions between the simple sugars and the proteins in the DME, which form melanoidins (consistently mis-pronounced by myself as “meladroidins” in the video), forming various flavour and colour compounds. Lastly, we want to heat the solution one last time, this time to 150-165C (300-330F), in order to develop some caramel and roast flavours, as well as to harden the sugar through developing a hard-crack. Food grade lime (pickling/slacking lime) or food-grade lye must be used. Do not use non-food grade materials. DO NOT add acids at any point – they’ll slow or stop the flavour development process. The Malliard reactions (135-145C/260-275F) are where fruit flavours form – the longer you carry out this part of the process, the more fruit-like the candi will be. The caramelization reactions (150-165C/300-330F) produce roasted flavours (coffee, chocolate, nuts). Again, the longer you hold this temperature the more of these flavours will develop. Lastly, you can stop the process at any point*; stopping after inversion will give you invert sugar (useful for English-style beers), while stopping after the Malliard step will give you a pleasant fruity sugar with minimal roast character. *I strongly recommend heating briefly to 150C to create a ‘hard crack’ – i.e. sugar which will take on a hard-candy like product after cooling. If you do not do this you will get a sticky nougat-like product. Alternatively, you can add water (~0.5 cups/kg sugar) to make a syrup. For every kilogram (2.2lbs) of sugar, blend in 1 tablespoon (15ml) of DME. Dissolve the DME/sugar mix into heated water – 250ml/1cup per kilogram of sugar. Heat gently, avoiding boiling, until the sugar is completely dissolved. Once the sugar is dissolved, increase the temperature to 125-135C (260-275F) to begin inversion. Hold at this temperature or 30 minutes by adding cold water, 1 tablespoon at a time, to the hot sugar mix and stirring. Try not to over-cool the sugar mix. After the 30 minute inversion period let the temperature increase to 145C (295F), at which point add your food-grade lye or pickling lime, pre-dissolved in water. Add slowly as to not drop the temperature below 135C (300F). You will require ~20ml dry lime (pickling lime) or lye (food-grade) per kilogram (2.2lbs) sugar. WARNING: these solutions are highly caustic, so use eye protection. Hold alkalized mixture at 135-145C (300-330F) until the desired colour and flavour formation is complete. If required, additional lye-lime can be added to drive additional flavour formation. Avoid adding excess lime or lye, as minerally flavours can be created. Increase temperature to 150C. At this point sugar can be cast into a silicone pan or onto a parchment paper. Alternatively, you can hold at 150-165C/300-330F to produce additional roast flavours. Cast into a silicone pan or parchment-paper lined pan, let cool, and the brew! Yep, in part 3 I state 1 tsp (5ml) per kilo; you added about half of that. DME can vary a lot on protein content, so 1/2 tsp could easily be too little (or just right); 1 tsp has consistently worked wel for me. That said, your image looks like it worked as it should; a dark red-brown colour. Chocolate flavours also sound right. You can keep the sugar close to the hard-crack temperature to get more roasted notes, but be careful as it is very easy to go from nice roasty notes to acrid burnt notes. I had another thought about the lime taste (by which I assume you mean chemical/mineral like, not citrus-fruit like). Its probably the amount of pickling lime you added, but it could also be (in part) due to minerals in your water – i.e. the effect of the minerality of the lime + the minerality of your water. You may want to try using distilled water, especially if your water is on the hard side. Definitely not enough DME. I have had some success. Still some of that gross lime taste, but it got pretty dark and lost the sweetness and it tastes a bit like dark chocolate or cocoa. There must be a point where it becomes overdone though? Perhaps far too bitter? i must have misread your part 3 amendments. You didn't cut it down to a teaspoon instead of a tablespoon? That must be it. I used half a teaspoon. Like Shindhere I got this from your latest Part III. I'll go bad to a tablespoon and try again. Thanks a lot. I have tasted a good sugar in a craft brew and it had just the Plum and other dark fruit flavours I'm looking for. Not nearly enough DME – my instructions state "For every kilogram (2.2lbs) of sugar, blend in 1 tablespoon (15ml) of DME". Also, not all DME has the same protein content, so you may have to increase the amount used over what I indicate to get proper malliard reactions. I followed your process along with your amendments in part 3. It was a 1KG batch so 1/2 tsp of DME. I was using a candy thermometre and being my first attempt I brought the temp down a little far a few times. Next time I should have more consistent temperature. I also didn't add any corn sugar. I missed the dilution part; the amount you added was probably correct. As for the aroma, I'm not sure what would have caused that – both sodium and potassium carbonate are stable and shouldn't break down at the temperatures we are using, and should be basic enough to drive the malliard reactions. What did you use as your protein source – DME, or something else – and how much did you add? In that case you're guess is likely correct; you probably added too much lye. Do you know what your temperature was during conversion? Also, how much protein source (DME or other) did you add? I'm using food grade pickling lime. But I added 40ml of my solution (100ml water with 20ml Lye Water), so doesn't that mean I only added 6.6ml of actual Lye Water? Did I calculate the 1Mol solution correctly? What kind of lime are you using? Does it indicate the chemical on the label? The reason I ask is that a number of products are sold as "lime", but the specific lime you need is Calcium Hydroxide. Other forms of lime will not work. I wasn't sure how much lime to use so I started with maybe a 1/4 tsp in 200ml of water. I added it sparingly using a shotglass. Still plenty of undissolved lime in the bottom that I discarded eventually. After about 45 minutes it still wasn't as dark as I wanted, so I mixed up 1/2 lime with some more water, and eventually got fairly aggressive adding the water to try and speed it up. After an hour or so I pulled the pin and hard cracked it. It has a kind of mild toffee flavour I guess, no dark fruit or anything though. It also leaves a pretty gross flavour in my mouth. I was convinced that it's too much lime, but I am not sure. I definitely hit a point where it wasn't getting any darker after 20 minutes or so. Any ideas? I wanted to get a ph meter to see what I'm doing. Really not sure how to measure the lime since it doesn't dissolved properly. Crystallisation can be an issue; adding a small amount of corn sugar (fructose) helps to prevent that. 40ml of lye water was simply way to much – I'd guess that for 1 kg of sugar you would need 5 ml; 10 ml at the most. Keep in mind I'm adding 10-15ml of a 1M solution per 1 kg of sugar; I'm not making a kg of sugar with 1M lye in it! Well, how it didn't work would be more accurate! The first issue I had was with inverting the sugar without acid. I heated it slowly and found that the sugar started crystallising again before I reached the temperature to add Lye Water. I added more water and a little citric acid and got the change in consistency I am used to with making invert sugar. I tried to make a 1 mol solution of Lye Water. While I did some science subjects, chemistry wasn't one of them and I may have got it wrong. The molecular weight of Potassium Carbonate is 138g and I wanted to make 100 millilitres at 1 mol. So I calculated 1*0.1*138=13.8g needed in 100ml. I then had a 74% solution so 13.8/0.74=18.6g. So I added 20ml to 100ml water. I now realise I should probably have weighed the Lye water out instead. Anyway, I added 40ml of this solution to the sugar and it started turning darker immediately, but instead of the fruity aromas you described, I got noxious fumes that smelt like burnt plastic. I took a sample of the sugar and it was far from burnt. Probably the colour of invert number 1. Yet the smell was so bad I feared breathing it let alone consuming the mixture, so I tipped it. Any idea what might have happened? It sounds like the lye water should work – it is essentially what you would get mixing wood ash with water, which produces a highly alkali solution. It should be food safe, so long as you are buying a brand intended for cooking. The only thing you may have to work out on your end is how much to use – I found a few examples of lye water; they were all very concentrated (probably 2-3x the concentration of the solution I use), so you may need to add minute amounts, or dilute it a little in water first. The candi sugar manufactures are secretive about what they use, but it appears that they use modestly refined beet sugar, with the impurities in the sugar acting as the amine source. DME simply substitutes for that – I've discussed this in detail in one of my other candi sugar posts. Isn't pickling lime calcium hydroxide? Calcium chloride is a brewing salt. 3rd batch, sugar + muscovado + dentist lime (i think is food grade or so) . tastes a little better but i don't have DAP i normally use Servomyces. Next batch, I will try again with the LME (from a previous brewing batch) + sugar + construction lime + correct temperature to avoid crystalization. Given the minute amount added, its probably OK to use construction lime. However, because the construction lime is confirmed to be food safe there is a risk (however small) that it may contain toxic contaminants. Hi Bryan Im from Argentina here is almost impossible get food grade lime so my initial question is why I shouldnt use the construction lime ? Thanks for the feedback, I'm glad people are experimenting with this and finding new/better ways to make candi sugar. I used sodium carbonate in my first attempt, and it worked fine (actually liked the taste better than with calcium chloride "pickling lime," but I think I used too much of the later and got a medicinal flavor). I've done two attempts. One using sodium carbonate (made from heating sodium bicarbonate "baking soda" @ 200F for about an hour) as the source for a base with cream of wheat for a protein nitrogen source and one using calcium chloride "pickling/slacking lime" for the base and DME. I compared both to professional Candi Syrup's D-180. Thank you so much for this step by step guide. The Candi Syrup came out very nice with bread, raisin, rum and fruit notes. As I did not have any DME laying around I used some Rice Syrup instead as a work around. I knew Rice Syrup has a lot of maltose and used it earlier for a yeast starter so figured why not and created a 250ml solution with SG of 1040. Not sure how or if it contributes to the final taste though. Congrats Bryan on being involved with an exbeeriment on Brülosophy for Candi Syrup. You help make the homebrew world awesome. Thanks for sharing, you are a gentleman and a scholar. It should work; it is used as a replacement for lye (sodium hydroxide) in baking. I've not used it, so I cannot state absolutely if/how well it will work. Sorry, didn't see this comment. It should – its a protein, but I having not done it myself I cannot say how well it will work. Bryan, thank you for the comprehensive explanation. I'm keen to trying it, but the problem is that I have no idea on how to get food-grade calcium or sodium hydroxide here in Russia. My question is do you think it is possible to use sodium carbonate (Na2CO3) instead? My understanding is that it can be used as it gives pH of 11.6 which is comparable to lime. I know that Ryan had negative experience with using sodium bicarbonate (NaHCO3), but still hope carbonate to be better as it gives higher pH and thus can be used in smaller quantities. Dear Bryan, is it possible using egg albumin instead of DME? 1) The time is really variable; I've had batches get to the point your interested in within a minute or two of heating to 125-135C, and I've had others take nearly 20 minutes – it depends on the amount of base (lye/lime/etc) that you add, how much sugar you have, etc. My advice would be to warm it on the lowest heat you can while warming – it'll take longer, but it produces a nicer product and is less likely to burn. If you want to avoid the darker flavours, simply don't bother with the 145C stage, or bring the sugar to that heat once and immediately let it cool. That gives you a more medium-sugar where the malliard flavours (stone/dried fruits) dominate. 2) I've not done a lot working out the syrup thing; but when I've tried it I always slowly add water to the hot sugar in order to bring down the temp while making the syrup. If you let it cool too much before, it'll simply crystalize and be nearly impossible to make into syrup. 3) You didn't ask this, but others have had issues with the sugar crystalizing while hot. The secret to preventing that is low heat – you don't want to stir the sugar any more then necessary, and you only need to stir when adding the cooling water. I've read that adding a bit of fructose (corn sugar) can also reduce crystalization – I haven't tried that yet, but plan on trying it for my next batch. Apparently 10% by weight is the sweet spot – pun intended. 1.) I'm going to use the sugar in a Gulden Draak-ish brew. I'd like to get some depth of flavor, but not a lot of chocolate or roasty flavors. How long would you suggest at the Maillard stage (125-135C), and then at the higher stages (145C)? I know it will depend upon my setup (water, elevation, etc.). 2.) Clarifying the syrup procedure: after the 145C stage, do I just add the 1/2 cup of water, cool it down, and then it's good to go? Should I cool it down first, then add the water? You need about 1/3rd more lime than lye. Your main tool though is your eyes – you want to add enough to drive the colour change like the one in my video, and no more. Thanks for such a great write up and explanation on how to make some belgian candi sugars for brewing. I am going to try this soon but I have lime not lye. Do you have an idea how much lime i should use, can we estimate this based on the alkalinity differences between lime and lye? Have you tested the fermentability of the sugars? Thanks for getting back on this. I got a good laugh at the prospect of getting soap out of this! I appreciate your feedback on the lye. Today, a friend plans to show me his method, using lime and DAP, so at least I'll have a comparison. After that, I will do a re-run with DME and more lye. If I get around to this, I will try and remember to post on the results. Btw, When I took my sugar to homebrew club for people to try, they pretty much suspected me of dissolving dead bodies when I told them I used lye! I've not yet hit a point where I generated off flavours. Keep in mind, the point of the lye (or lime) is to alkalinize the sugar. Lye is about as strong an alkalanizing agent as you can get, and at least in my experience I hit the point where I get no further redning (Malliard reactions) of the mix before I notice the mineral flavour that you would expect from too much lye. That said, other bases (e.g. pickling/slacking lime) are much weaker bases, so you could hit the mineral taste threshold with them. I do not know where that occurs, but I think Ryan over at Ryan's blog (link in my post somewhere) hit that point with lime. As for measuring the lye, your best bet is a scale – a 1M to 2M (40g/L to 80g/L) solution works well, with 20-100ml of that needed per kilo of sugar (10-50ml per pound). Again, 1M lye is causting, 2M is downright nasty, so be careful! My lye comes in the forms of prills, so its hard to say what volume of solids that it. I realized that my above description was a typo – 20ml of 1M lye is what it should read, not 20ml of solid lye. As for your experience, I think you undershot on the lye, which would explain your relative lack of flavours. The lye drives the malliard reactions, which in turn is what gives many of the flavours we are looking for. 45ml @ .1M is equivalent to 4.5ml of 1M; or about 1/4 of what I used. In tests since I've used even more, and achieved "bolder" malliard flavours with great success. Hi there. I appreciate your time posting on this, and have been enjoying your perspective alongside others who've blogged about the candi sugar prep. I wondered what your views are on an upper limit on the amount of lye without getting off flavours? I noticed that in your other post you mention using a total of 2ml solution of 1mol lye, whereas in this one you mention using 20mls of solid (?). What would you recommend by way of volume in terms of molarity? Tonight I tried your process out with a gradual addition of lye, totaling 45mls at 0.1mol. After 50 mins keeping it around 135c, my sugar was a fair bit darker than yours. I liked it, but don't feel that it had the complexity that I was hoping for after getting super excited by the blogs. My two attempts at moving on to higher temps after that (a further 15 and 30 mins) weren't nice, and came out black and a bit singed. Would love to hear your thoughts on the lye. Also, have you tried the process with WYeast nutrient or yoghurt as some others have suggested? I'm glad you liked the post. Let us know how the sugar prep goes! Thanks for taking the time to share your results and recipe! Especially enjoyed your insight on the differences between using DAP and DME. I'm looking forward to trying this out for a future Belgian Dark Strong Ale. I'm glad you enjoyed the posts Dennis. Just so you know I've done a few experiments since, using smaller amounts of DME. I've found that the amount required is quite small – 1 tsp per kg (1/2 tsp per lb) appears to be sufficient. Lower doses are easier to handle (less foaming during heating, etc), and the colour & flavour formation seem unaffected. I've also doubled the amount of lye that I've been using – it makes things go a lot faster, and seems to bias the flavour more towards the stone-fruit side of the equation. I think that's because it drives the malliard reactions at a high rate of speed, meaning flavour development is done before you get significant carmelization of the sugar. I'm still playing, but it looks like controlling the lye addition does more to effect the final product than does selective use of the "medium" versus "high" heat ranges. I'm glad my posts were helpful to you! And I'm glad to see someone else try using DME for their protein addition. 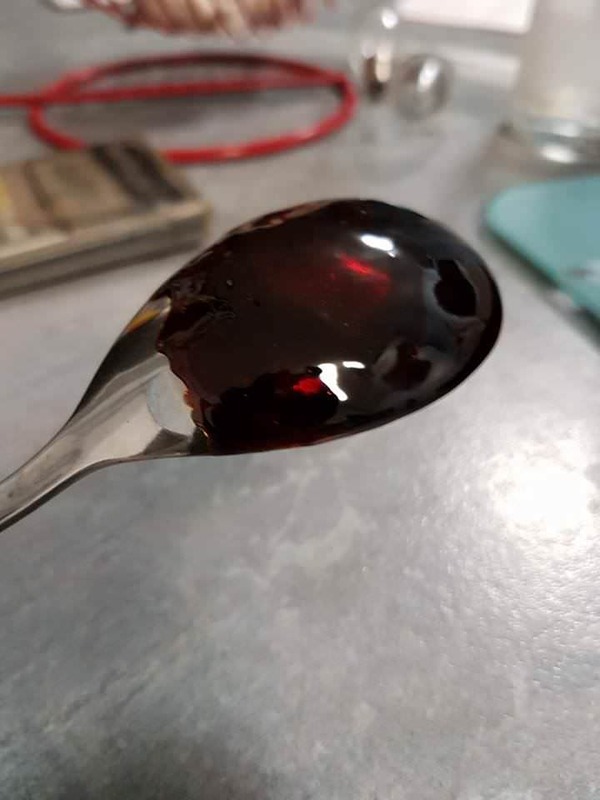 I've been meaning to try it since about the time I put my candy syrup posts up online, and just haven't been able to find the time, so thanks for giving it a go and proving it works. I too was rather disillusioned with the idea of DAP- I agree it seems to be to be awfully limiting to use only one precursor to a reaction which is meant to be so wildly varied. And I'm not entirely unconvinced it wasn't the reason for my constant scorching. The question they raised is why didn't I use diammonium phosphate (DAP) – commonly found in yeast nutrient – for my sugar. In many ways DAP is ideal – it is mildly basic when dissolved (pH 7.8-8.0), and decomposes into ammonium which can then drive the Malliard reactions. It seems like a better option than DME + a strong base. Indeed, the DAP method is one of the more widely used, including in the 'Ryan Brews' blog post I linked to above. The answer as to why I didn't use DAP is simple – chemistry. DAP provides one substrate for Malliard reactions – ammonium ions. This greatly limits the range of Malliard products that can be produced. DME, in contrast, contains proteins which undergo hydrolysis (breakdown) during the inversion step. Protein hydrolysis will create hundreds, if not thousands, of products that can then participate in malliard reactions – everything from individual amino acids (23 in all), to hydrolysis products of those amino acids, to partial protein degradation products (peptide chains, di-peptides, etc). As with painting, having a larger molecular ' palette' provides you with a more diverse and interesting end-product. In my trials I did try DAP, using the method outlined in Ryan Brews (i.e. DAP + lye). The process was much faster than the method I outlined here – it took about half the time to develop the desired degree of flavour. But compared to the method I outline here the quality and complexity of the DAP-based candi was less than the DME-based candi. The DME candi had a broader range of flavours – plums, nuts, caramel, coffee and chocolate, while the DAP-based candi was mostly the roast coffee/caramel flavour. Moreover, the DAP had a chemical-ish (ammonia-like) tone to its aroma, while the DME-based candi was pure fruit & roast aromas.